Looking for edgy, on-point comedy? Look no further. Comedian and actor Dave Chappelle takes the SFJAZZ Center stage this Saturday at 7:30 p.m., and San Francisco may never be the same. Known for his “Chappelle’s Show” series on Comedy Central, Chappelle combines influences from such legends as Richard Pryor and George Carlin. On Saturday, he’ll also be joined by several special musical guests, including urban jazz harmonicist Frédéric Yonnet. Find out how sometimes people can be both. Check here for more details. No matter your price point, California really does have it all. Actual implementation of the district. Cue the dramatic entry music – no, this isn’t a bride entering the wedding hall, it’s the notorious Case-Shiller Index report, this one for November 2013. Released today, it offers three views of what’s happened in the Bay Area’s “high-tier priced” homes, which are currently classified as those selling for more than $801,000 since 2013. 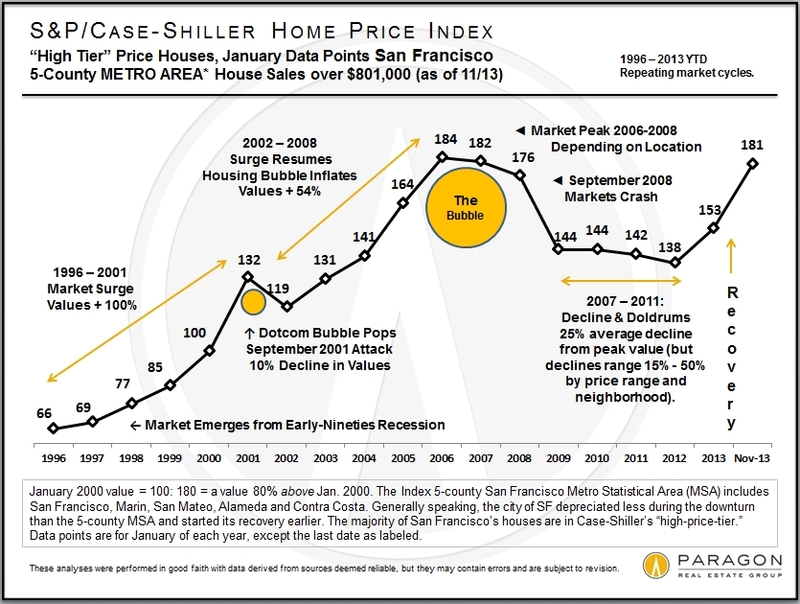 It’s important to keep a few things in mind: first, the recovery really seems to have began in early 2012, and the Case-Shiller is sometimes not the best indicator for San Francisco itself as it measures the five-county metro area, not just the city. But with these caveats, let’s proceed. 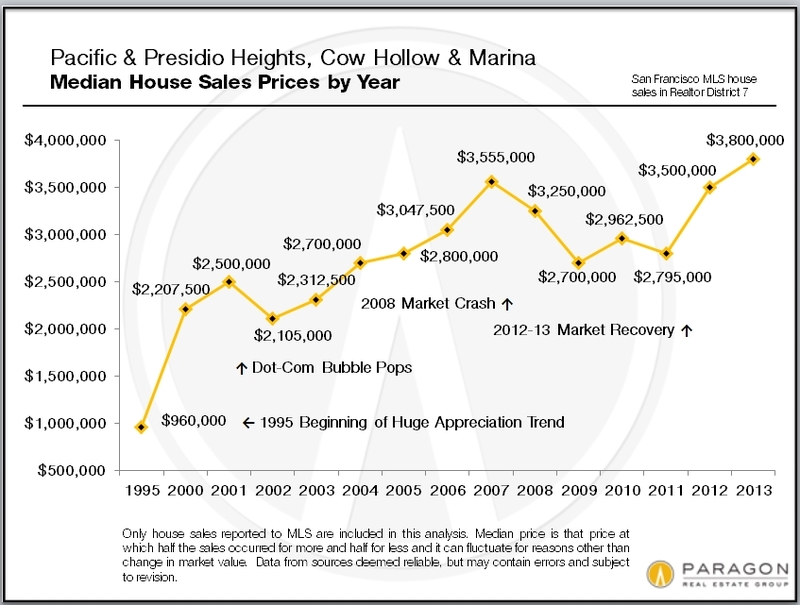 This chart shows Bay Area home appreciation in 2013. 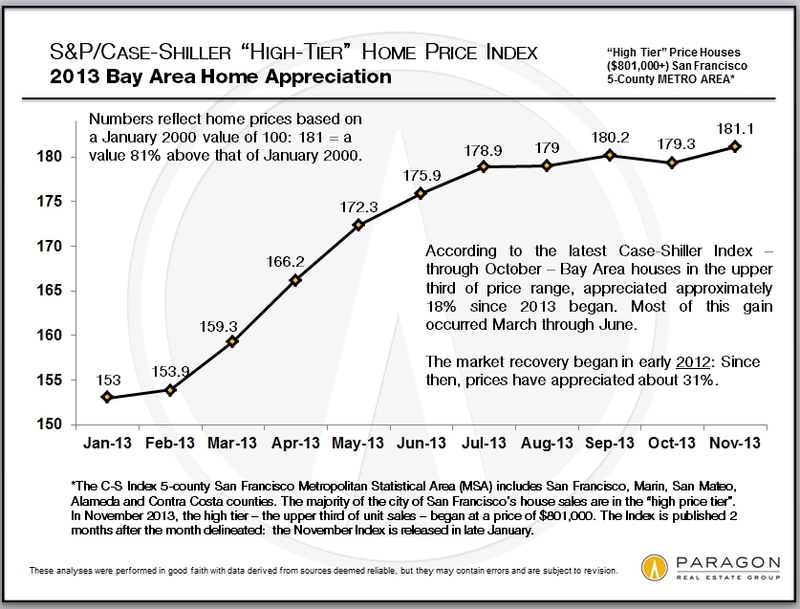 You’ll notice a definitely steady rise here, with Bay Area houses in the upper third of the price range appreciating approximately 18 percent since the beginning of 2013. Most activity occurred from March through June. Something to note: Since the market recovery began in early 2012, prices have appreciated about 31 percent. This chart shows that market recovery from 2012 to 2013. Both years, after dramatic spring surges, home prices plateaued in mid-summer and autumn. Finally, this chart shows market cycles from 1996 to 2013. Here you’ll obviously see a lot more dips and peaks. It can be a rough ride, so hang on tight. The San Francisco Examiner this weekend presented a sobering scene for buyers in the local market: a two-bedroom bungalow in need of a significant amount of TLC garnered 50 visitors in the first week alone – and is expected to fetch far more than the asking price of $550,000. According to real estate agent Ruth Krishnan, who is handling the bungalow’s sale, buyers are feeling as though they must act now or pay the price later. The article cites a market report by Paragon that found that low supply, plenty of cash, high demand and cheap credit were all factors in last year’s price jump. 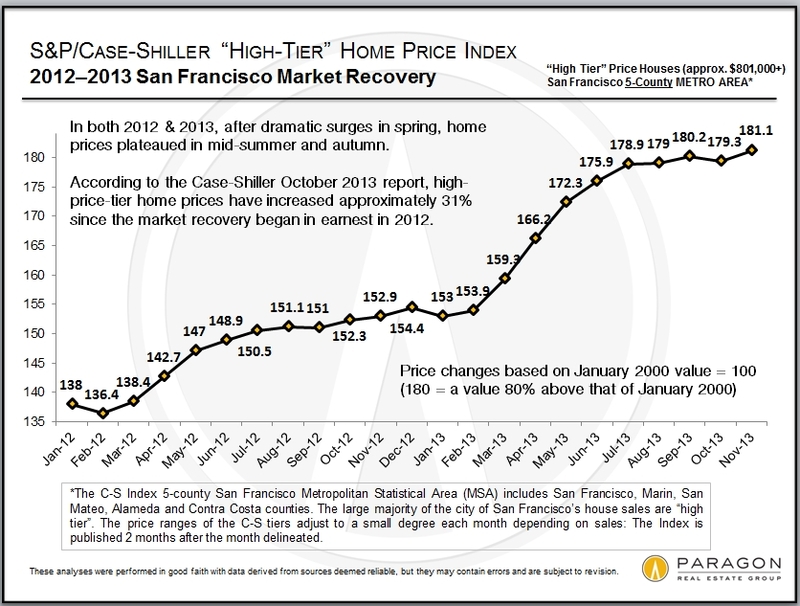 In the recovery from the recession, the city has now exceeded expectations of prices. According to the Paragon report, 2013’s median price of $915,000 more than doubled the state median and passed the previous peak of $895,000 that was set before 2007’s housing collapse. Sales of condos and tenancies-in-common were most frequently seen in the northeastern part of the city, while the southeastern part saw the most home sales. The former category saw about 1,000 sales, while the latter saw about 500 sales. We aren’t sure if winter will ever arrive, but while the forecast calls for mid- 60′s and partly cloudy skies, it’s perfect weather for strolling through one of your favorite San Francisco neighborhoods. 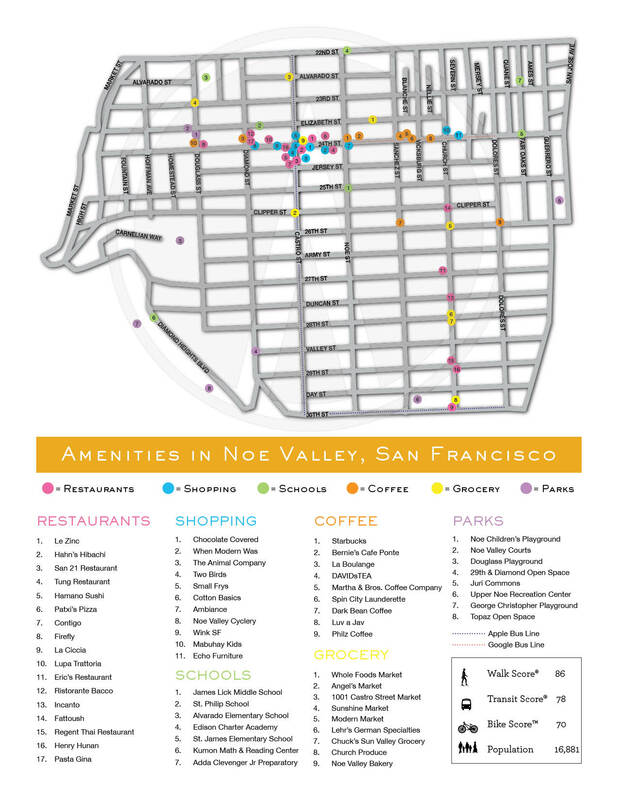 Whether you’re jones-ing for a pick-me-up from Philz Coffee, looking for that perfect dress at Ambiance or just want to grab lunch and take it to a park, Noe Valley is just the place to enjoy our “not-so-winter” winter. Looks like the San Francisco condo market is getting a little more challenging for buyers. According to urban residential marketing and sales firm The Mark Company, condo prices in the city jumped 18 percent year-over-year in December 2013. What’s more, new construction inventory was down a whopping 78 percent year over year. You don’t have to do a lot of math to realize how these two statistics are related. Mark Company senior director of research Erin Kennelly told the San Francisco Chronicle that with such low inventory, price inventory is expected to continue this year. The firm’s Condominium Pricing Index is part of its monthly Trend Sheet and takes as its base the per-square-foot price of of a newly built tenth-floor, 1,000-square-foot condo. In addition, its Penthouse Pricing Index takes as its base a new thirtieth-floor, 2,000-square-foot condo. This was found to be $1,776 per square foot. 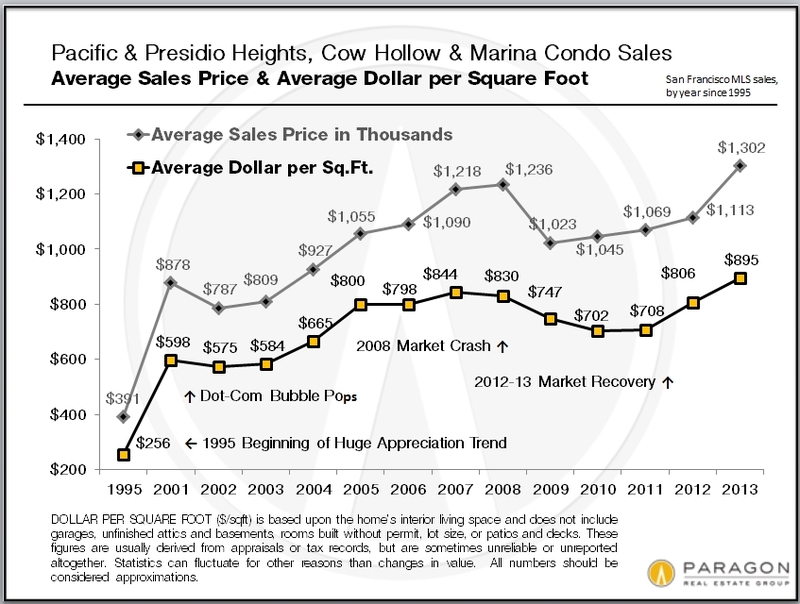 For resales, the price per square foot was $868, an increase of 26 percent year over year. 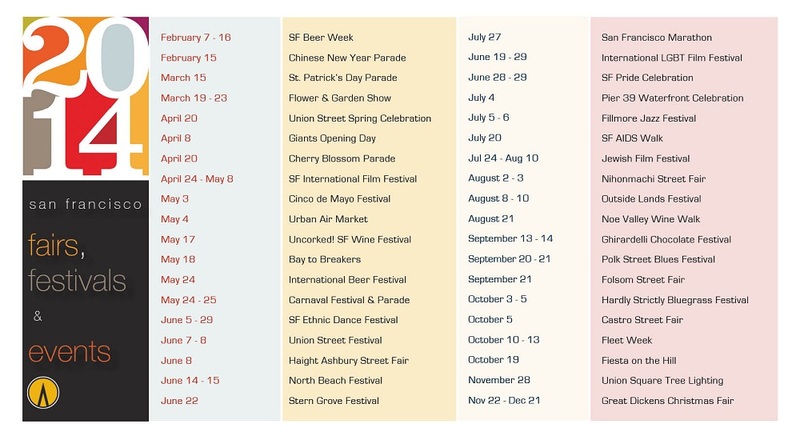 What’s Happening in San Francisco in 2014? A LOT! It’s hard to believe it’s already 2014! There’s such an abundance of events throughout the year in our amazing city, where does one begin? Well, we have something to help get you started. So before you book up your weekends, check out our handy event calendar to give you some inspiration. (CLICK ON THE IMAGE TO EXPAND).